This member has purchased a 2015 Ford Focus. This is a tough one for me, since I'm in the U.S. and am not familiar with cars that are only offered in Europe. Perhaps something French? I do like the seats and ride in the Buick Verano, sold in Europe as the Opel Astra. But I'm not sure if the seats and suspension tuning are the same in the Astra. 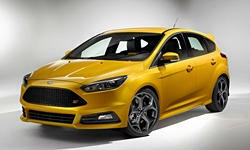 Tested the Ford Focus and feels great. Ride, sound, steering, and the Ecoboost 125cv engine seems cheap to run. I have a littel bit of a problem with the seats. I'm used to my fluffy 1999 Renault Clio seats and new cars (almost all I tried) seem hard and are full of bumps pushing my back. I suppose you get used to the seat you use everyday? Too many times people find out that they can't get used to a car's seats. They're the hardest thing to sufficiently evaluate during a test drive. If they're iffy, I'd try to spend more time sitting in them. Once you do have a finalist, mght it be possible to rent one for a day or two? It's possible that one of the French makes continues to offer a car with seats you'd really like. I would vote for getting the car you like and the seats you like and putting them together. Whatever car you want, search the enthusiast's site for it and/or ask if others have swapped in seats, what they've used, how it's turned out. Then get the car, source the seats, and have a body shop do the work for you. Obviously this isn't probably feasible with heated/cooled/powered seats, but I'm assuming you don't need those features. Alternately, maybe you go to the biggest used car dealer you can find and just sit in all their seats for an afternoon. See what seats you like, and then of the acceptable seats, research which seat has the best car that goes with it. I had a longer test with the Focus and after a while I forgot about the little anoyances I had with the seat and enjoyed the ride a lot. I think I'm getting the Focus and if I in the long run I really feel the seats are not comfy enough I'll try to get some from a Renault Captur or some other I find perfectly fitting my back. Thank you Michael, you where really helpful! Hopefully you'll like the stock seats. I doubt it's easy to swap others in these days, as they usually include the side airbags. Just a last comment in case someone find it useful. I bought the Focus and I'm really happy with it. When I had the car in my hands I tried many configurations of height and backseat tilting. The key for me was tilting it much more to the front that what I was thinking it would be comfortable. It was a little counterintuitive for me, but an almost straight possition felt perfectly comfortable and after various 100km trips I feel I could do much longer trips without my back aching. I suppose my Clio had almost not lumbar support and the Focus has a lot, so the needed inclination was very different. Maybe it's straightforward for other car buyers but it wasn't for me so if someone is having problems like mine, I would suggest to try different backseat tiltings before discarding a seat.